"This pancake recipe is as good as it gets. 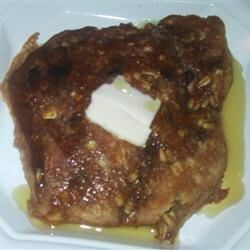 Cinnamon, oatmeal and raisins make this a too good, and sinfully tasty pancake!" In a microwave safe bowl, combine apple cider and oats. In a separate bowl, stir together butter, cider vinegar and cinnamon. Stir the two mixtures together and microwave on high for 2 minutes. Let cool to lukewarm. Stir together flour, baking powder, raisins and eggs. Blend flour mixture into oatmeal mixture. Not a hit at our table. We did not taste the oatmeal and they were not fluffy. These tasted great. I did need to add more water before I cooked them. Everybody loved these. I did not add the raisins and I used spelt flour. These are very good.